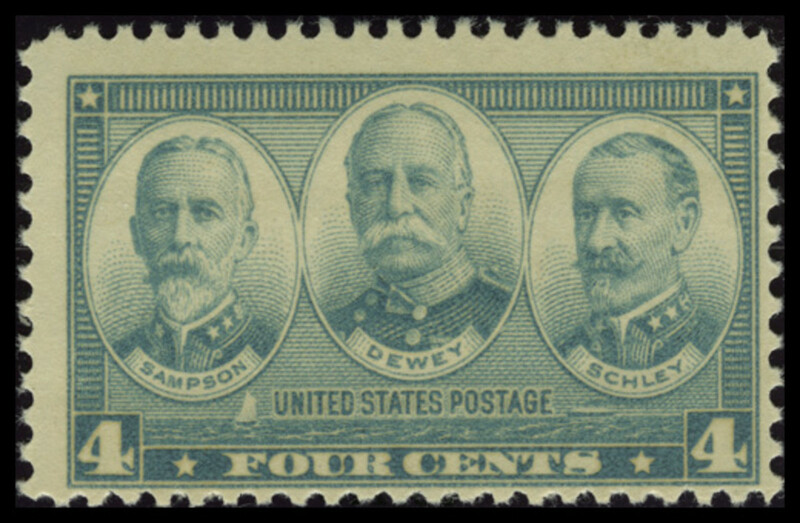 The United States Post Office issued a series of commemorative postage stamps between December 1936 and May 1937 to honor the Navy and Army. 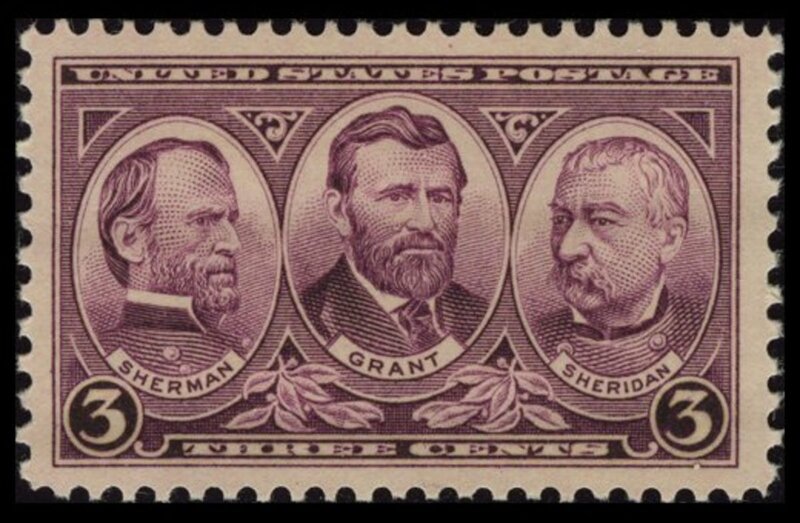 The Navy stamps pay tribute to naval heroes and leaders from the Revolutionary War, the War of 1812, the Civil War, and the Spanish-American War, as well as to the United States Naval Academy. The Army stamps honor a comparable group of army heroes. These commemorative stamps provide a fascinating window into some of America's military history. 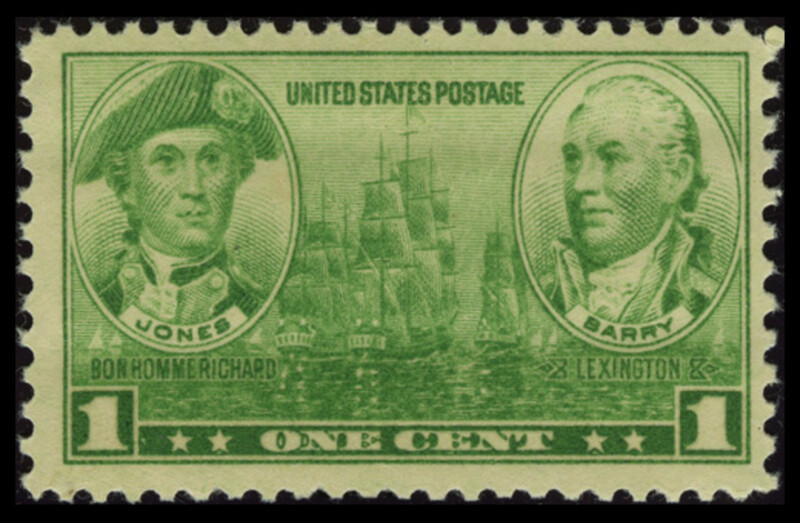 The green 1¢ Navy stamp features portraits of Revolutionary War naval heroes John Paul Jones and John Barry. Under each man's portrait is the name of a famous ship that he commanded: Jones's ship the Bonhomme Richard and Barry's brigantine the Lexington, respectively. 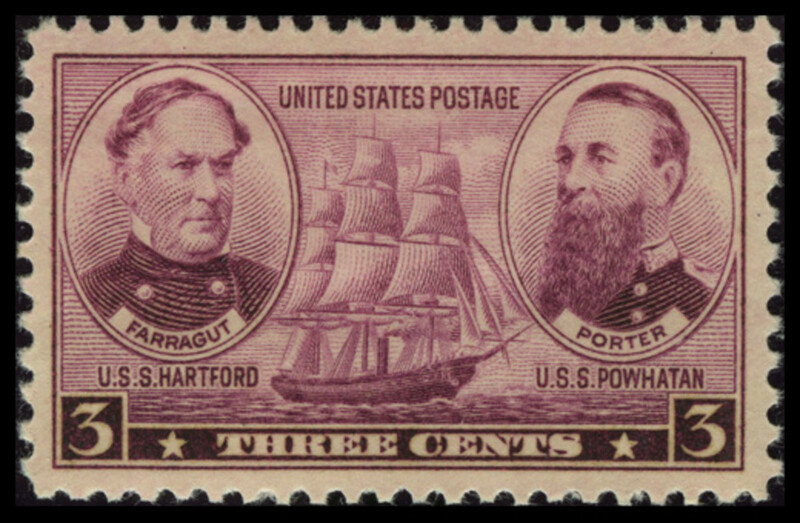 The stamp also depicts three vessels of the Continental Navy. 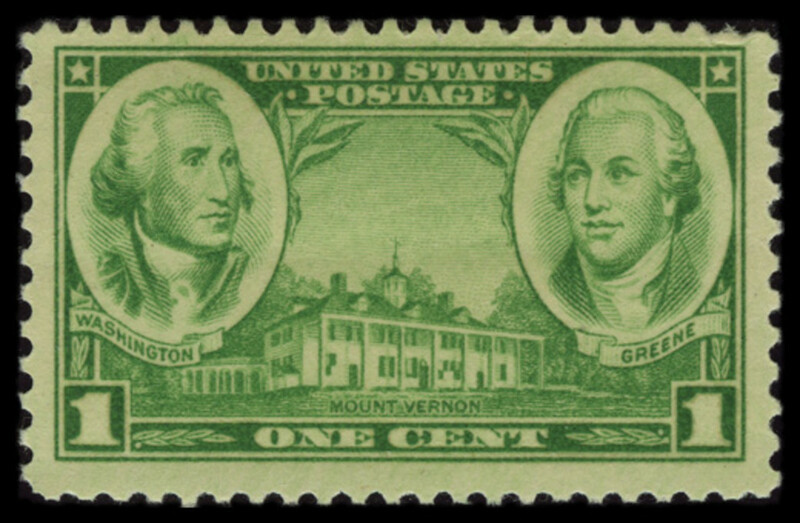 The corresponding one-cent green Army stamp, featuring Continental Army Generals George Washington and Nathanael Greene, was issued on the same date as the one-cent Navy stamp. 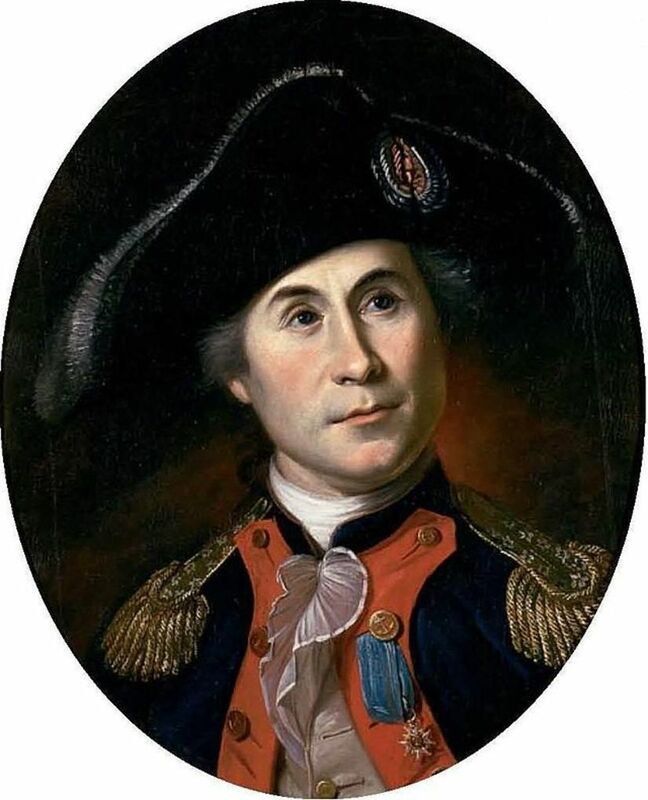 Date and Place Issued: December 15, 1936, in Washington, D.C.
Born in Scotland, John Paul Jones (born John Paul — he added the surname "Jones" later) sailed on various British merchant and slave ships beginning at age 13. He settled in Virginia in the early 1770s and volunteered for the Continental Navy after the outbreak of the Revolutionary War. 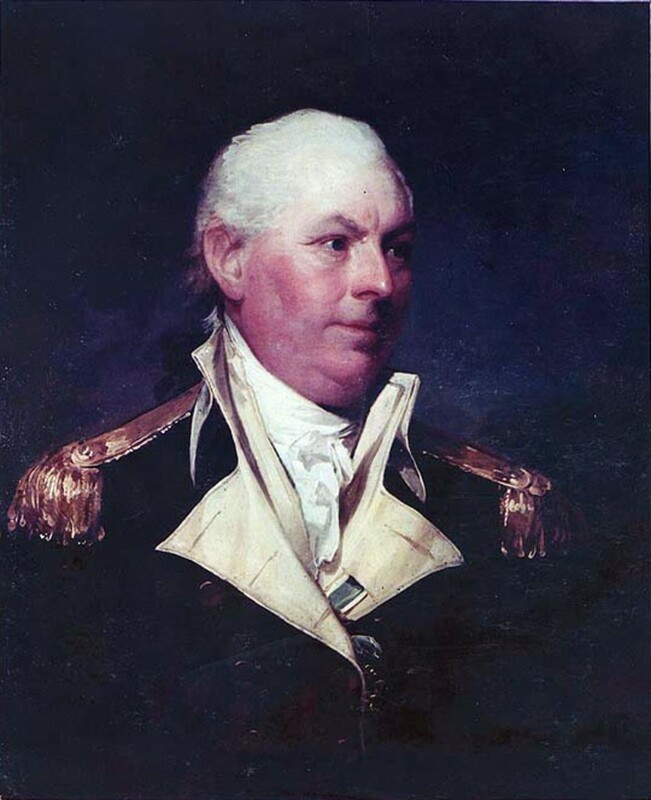 In December 1775 Jones was commissioned as a First Lieutenant and assigned to the Alfred. In early 1776, he became the first officer to raise an American flag — the Continental Colors, also known as the Grand Union Flag — over a naval vessel. Commanding the Ranger in February 1778, Jones marked another first, as the Ranger became the first American ship to be saluted by the French after France recognized the new American republic in the Treaty of Alliance. Under Jones, the Ranger won a significant battle in April 1778, capturing the British sloop HMS Drake. This victory showed that the Royal Navy was not invincible and greatly boosted American morale. 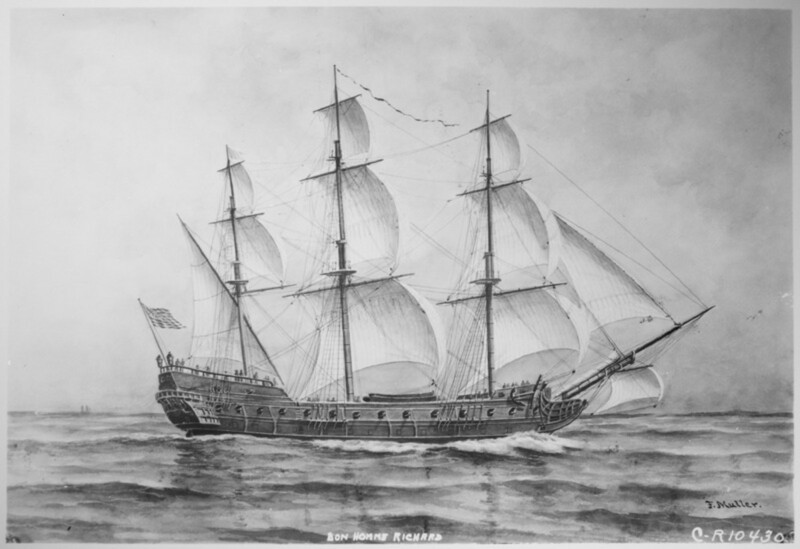 In 1779, Jones took command of the Bonhomme Richard, which was on loan from the French to the Continental Navy. Leading a five-ship squadron, Jones sailed around the British Isles and captured sixteen British merchant vessels. On September 23, Jones engaged the British frigate HMS Serapis and a second ship, the Countess of Scarborough, in the Battle of Flamborough Head in the North Sea off the coast of Yorkshire. Although the Bonhomme Richard was badly damaged and ultimately allowed to sink, Jones rallied his crew with the vow, "I have not yet begun to fight!" and succeeded in capturing both the Serapis and the Scarborough. Afer the war, Jones served for a time in the Imperial Russian Navy, although he remained an American citizen and naval officer. He died and was buried in Paris in 1792, but his body was brought back to the United States in the early 1900s and re-interred in the Naval Academy Chapel in Annapolis. John Barry was an Irish Catholic merchant seaman who settled in Philadelphia in the early 1760s and built an excellent reputation for seamanship. When Barry volunteered for service in the Continental Navy in December 1775, he was commissioned as a Captain. Barry commanded the Lexington from December 1775 to October 1776. Under Barry's command, the Lexington in April 1776 became the first American ship to engage and capture an armed British warship, the Edward. Barry also captured several other armed vessels as commander of the Lexington. From 1776 to 1780 Barry served as senior commander of the busy Port of Philadelphia, supervising ship construction for the Continental Navy. In December 1776 he assembled a group of volunteers to assist General George Washington in crossing the Delaware. Barry's volunteers also participated in the Battle of Trenton that followed, and in the Battle of Princeton in January 1777. While serving as commander of the port, Barry also captured and sank several British ships on the Delaware. Barry took command of the Alliance in September 1780 and engaged the British in several notable battles. In May 1781, seriously injured and facing surrender, Barry rallied his officers and crew to defeat the British ships HMS Atalanta and Trespassy. On March 10, 1783, five weeks after the Treaty of Paris that ended the war, the Alliance fired the final shots in the Revolutionary War in a battle with the British ship Sybil. 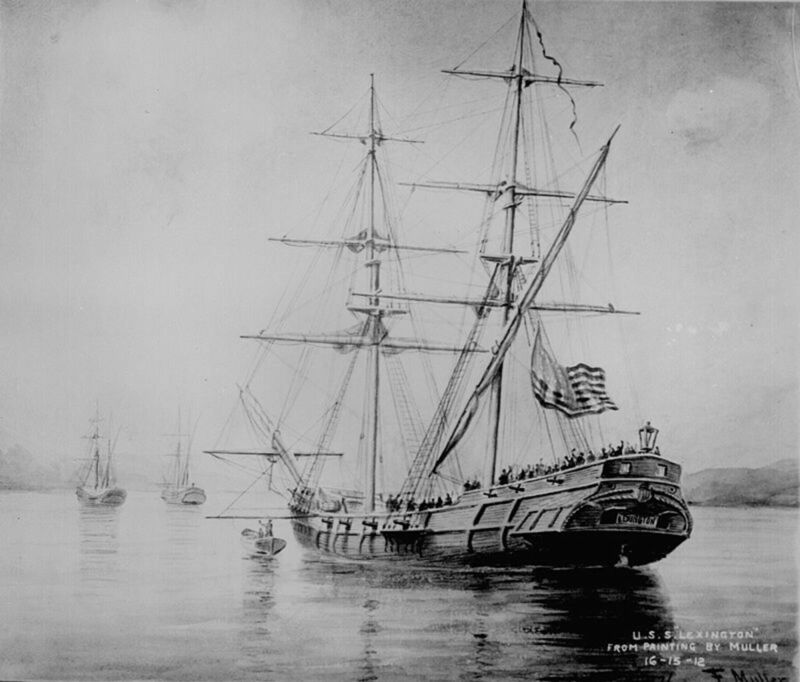 After the War, when President George Washington established the United States Navy, Barry was given the first commission and the command of the frigate USS United States with the title of Commodore. Having also authored a book on naval signals and mentored many future naval officers, Barry is widely credited as the "father of the United States Navy." So now you know some of the history behind the one-cent Navy commemorative stamp of 1936. 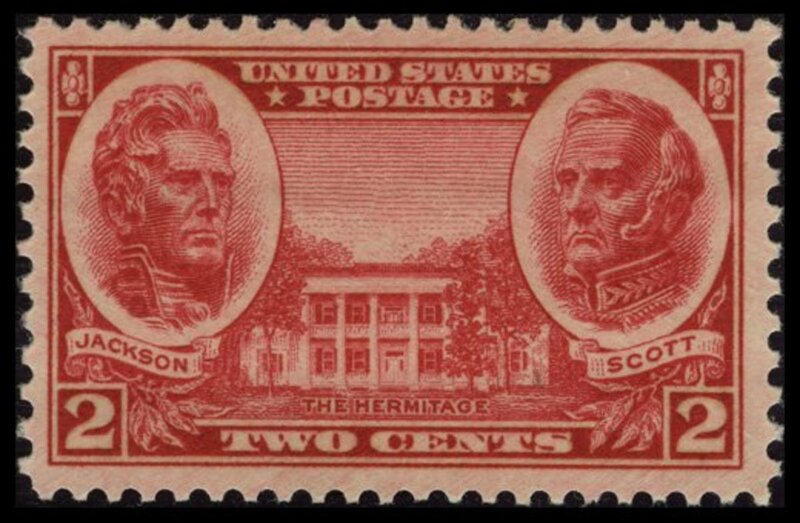 Collecting stamps, especially commemoratives, is a great way for both children and adults to learn history. 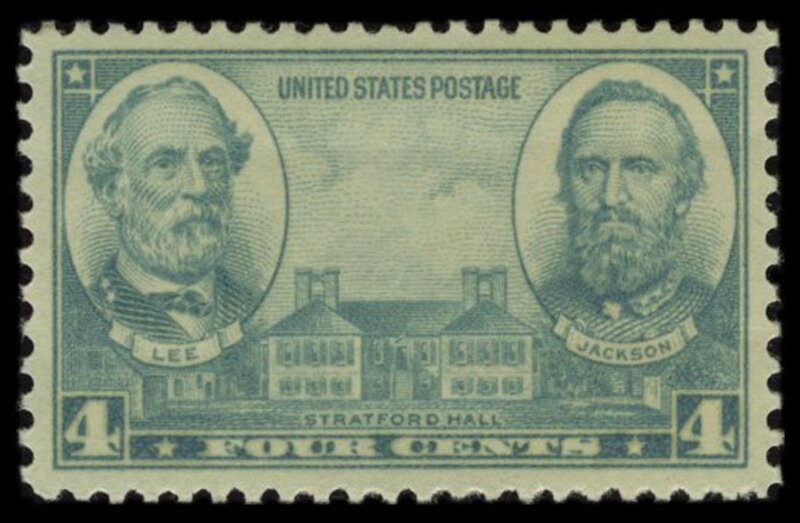 The United States alone has issued hundreds of commemorative postage stamps, and thousands of stamps that tell interesting stories have been issued worldwide. 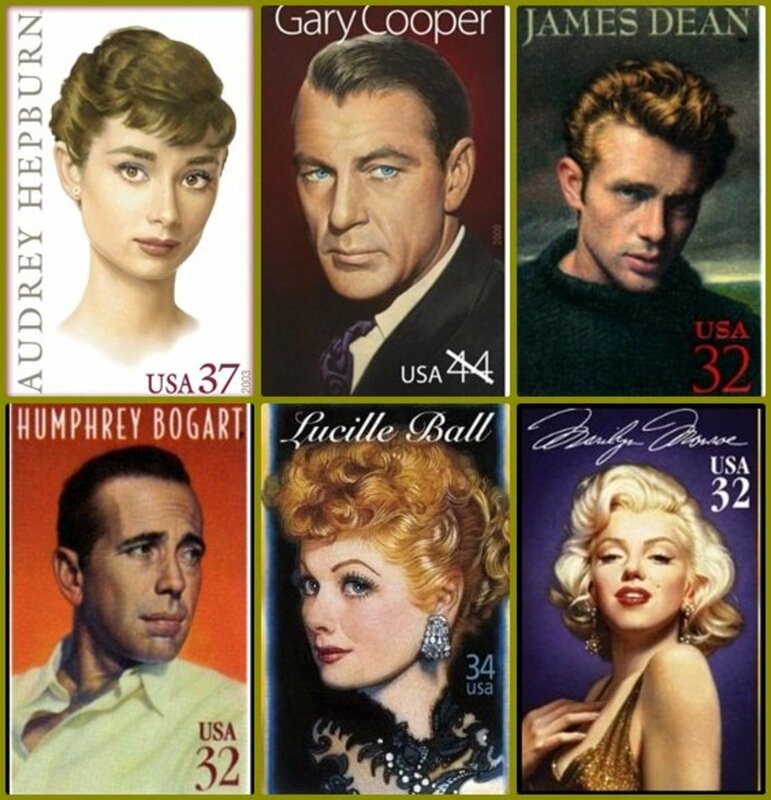 Most of these commemorative stamps are affordable for collectors. Give stamp collecting a try. It's fun and educational! Hello I have three one cent stamps undone of Jones and Barry and wondered what they would be worth.